Empyting portable camping toilets or the cassettes from your permanent RV toilets is usually a job that one person in the family gets. If you’re like me, I am happy to leave that job to Chad. It’s not that it’s a typical boys job. It’s more that I have a really weak stomach and the slightest smell is likely to make me ill. Well, that’s my story and I’m sticking to it! Seriously though, I would do it if I had too, and to be honest, it’s not that hard. Portable toilets these days are made in such a way that they are easy to use, easy to keep clean and easy to empty. If you are doing this for the first time, however, here are some simple tips to get you started. Follow these and you’ll become a pro in no time. We speak from experience. Our first foray into chemical toilets happened during a shared road trip with a few friends in New Zealand many years ago. The two boys did the manly thing and went to empty the cassette. We aren’t quite sure what happened, but a hose went astray and there was lots of yelling and screaming. It’s a moment that keeps being re-lived over and over again when we all get together. We’ve put together a quick video to show you how easy it is. This is possibly the most important step of all. Like you, we love being in the outdoors and love the freedom we have to be able to explore countries and destinations on our road trips. To be able to do this we need to always be mindful of keeping the environment and our surroundings as clean as possible, ready for other like-minded people to enjoy, just like we have. This means only emptying your waste in authorised locations. All over the world, locations are set aside for emptying waste. You just have to know where they are and how to find them. In official campsites and campgrounds, there are usually dedicated areas for such purposes. When you arrive at one of these, it’s always a good idea to seek it out before you set up your site or pitch, and identify the access routes to it. A good tip is to consider the time of day you might be leaving, or want to use it. It’s always best to try and avoid the usual check out times. No-one really ever wants to queue with cassettes or waste tanks in your hands for long periods of time. We are going to focus on portable toilets here, but of course, it’s a similar process for permanent RV toilets. The only difference is the toilet stays intact and the cassette is pulled out, usually from the outside. For your portable camping toilet, most will come with two tanks, the freshwater and the waste tank, that are easily separated. All toilets reviewed on this website have two separate tanks. That’s why we refer to them as the best camping toilets, as they are the easiest to use. Undo the latch that keeps the two tanks attached and separate the tanks. Whilst these tanks are all contained and are easy to control when emptying, it’s a good idea to put on some disposable gloves. It just helps to keep things sanitary and we always have some on board wherever we go. Whilst the waste tanks can get heavy, especially if you have some of the five-gallon (plus) tanks, we are still talking portable toilets here so they are usually manageable. If you are concerned with the weight of your unit at all, an option is to empty it more regularly. If possible, park your vehicle as close to the emptying spot as you can. Carry the tank to the dumping location. 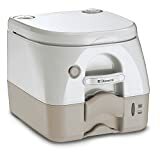 Our recommendation is always to buy a portable toilet that has a rotating spout for it is here at the point of emptying your waste that it earns the few extra bucks you’ve paid for the pleasure. The rotating spout puts the waste to be emptied even further away from you and your hands. It’s a feature worth its weight in gold. If you don’t have a rotating spout, you’ll just need to reach out a little further to ensure you don’t get splashed. In this situation, gloves are definitely a good idea. Some disposal locations have open grids whilst others have built up box type configurations with lids. If there is a lid, be sure to open it first or else disaster will strike! If you are used to emptying, you can take the lid off the spout earlier, but if not, take it off at this point, ready to empty. Hold the tank over the disposal area, ensuring that you are well clear of any obstacles. The last thing you want is to be splashed at this point. Most disposal areas will have a tap or a hose nearby. Fill up the waste tank with fresh water and give it a good swirl around. Again, if you are concerned about being splashed, put the lid back on before you do so. Empty the water out into the disposal area once again. We like to do this a number of times. The more fresh water you can rinse through the waste tank, the better. In the video below, we haven’t left any water in the tank as we were preparing this for the final time before packing it up again to put into storage for a while. If we were continuing to use it, we would have left a small amount of water in the tank, to mix with the toilet chemicals we would have replaced. If the freshwater tank needs re-filling, this is also the perfect time to do so. Put the two tanks back together again, the same way you took them apart, but in reverse. You are now ready to put the toilet back into its position, or like us, to take it home. Remove your gloves and throw them in the bin. We still use hand sanitiser afterwards, just as an extra precaution.